Kristine M. Lohr, MD, MS, is Interim Chief, Division of Rheumatology and Medical Director, Rheumatology Clinic at the University of Kentucky. There, she also serves as Professor of Medicine and Director of the rheumatology fellowship program. She is certified in Internal Medicine and Rheumatology. I wanted to become a physician because after reading both the Sue Barton and Cherry Ames series and non-fiction scientific books (e.g., “Microbe Hunters” by Paul de Kruif), I knew that becoming a physician “just fit.” As a second grader, I announced that I was going to be a doctor. No family members or relatives worked in health care. Our family was healthy and rarely had a need to see a doctor. (I do remember our family doctor making a house call when I had scarlet fever). I am the proudest when patients thank me for being their doctor, for listening to them or for spending time with them. Recently during her second visit, a patient told me that she didn’t know why but I was the only doctor that she opened up to about all the problems in her life. The reason I serve is to represent practicing rheumatologists through the evolving Maintenance of Certification (MOC) process. I want the process to assess that we’re “keeping up” with the ever expanding, evolving body of medical knowledge. I want the program to be as seamless and simple as possible with what we do every day, so that MOC doesn’t adversely impact our face-to-face time with our patients or with our work-life balance even as they help us stay current in our field. What didn’t you know before joining an ABIM board/committee? I didn’t know that you had to “check your ego at the door.” A colleague gave me that advice as I started my ABIM tenure on the Rheumatology Board Exam Committee. Sometimes I would think I’d written the best multiple choice test question ever, until we started reviewing questions and working together to resolve ambiguities and uncertainties. Those committee meetings were the best learning experience about medical knowledge and teamwork that I’ve ever had. 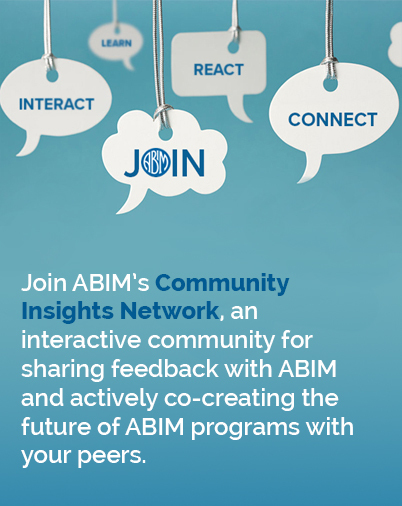 What did you learn about ABIM after joining a specialty board? After joining, I learned that the ABIM executives and staff are passionate about providing the best possible way for physicians to demonstrate their ability to provide excellent care to patients. They put a lot of time and effort into listening to diplomates, reassessing the MOC program and initiating changes with the goal to certify that we remain current in our knowledge and delivery of excellent patient care. What’s your favorite thing about serving? The best thing about serving is that I can be an active participant in transforming ABIM and the MOC process. I would encourage others to join ABIM governance because you really can make a difference and develop an understanding of the process behind and importance of certification. Aside from medicine, I am also interested in music, horseback riding (especially dressage), work-life balance, spirituality, interprofessional education and bringing people together to accomplish a task or just to get to know each other. Before moving to the Bluegrass region, I lived in cities and boarded my horse. Now my family (four dogs, a barn cat and two horses) and I live on a farm.